Elephants have always attracted me. For ages, temple elephants have been a vital part of temple ceremonies and festivals especially in South India. In Kerala, they have a pride of place – as evidenced by the Pooram festivals or the Punnathur kotta, the place for temple elephants at Guruvayoor. Elephants have been the central theme of many films : Yanai Pagan, Yanai valartha Vanampadi, Nalla Neram, Ram Lakshman, Annai Oru Alayam, Kumki; more beautifully portrayed in some Malayalam movies like - Aanachandam, Gajaraja Manthram and the ultimate Guruvayur Kesavan … the love of the film industry dates back to 1937 movie ‘Elephant boy’ made at the London Films studios at Denham, and in Mysore. IN Kerala, it is quite common to see elephant walking on the street or being transported in a truck standing so comfortably .. .. in Tamil Nadu, the annual elephant rejuvenation camps conducted by TN Govt have been a great hit – the elephants of various temples, Mutts and various other places are provided rest, medical treatment and happiness in the forest environ for 48 days. The elephants residing in various part of the State are transported in trucks to Mudumalai, where take rest and are provided healthy food and medical care ~ yet the Western World would often put a stray article trying to indict Indians on elephants being subjected to harsh treatment and being treated badly. Little would they know or understand the love and affection that people here have for the mammoth animals. 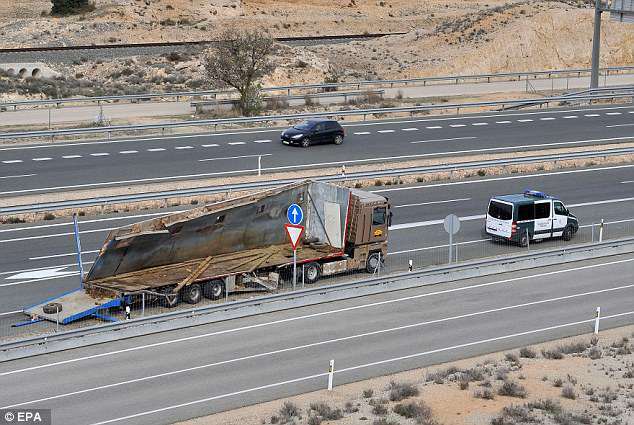 Miles away, an elephant died and several others ended up loose on a Spanish motorway after the circus lorry they were in overturned today. MailOnline reports that Police had to close the A30 in Pozo Canada near Albacete south east of Madrid after the extraordinary crash. Motorists filmed the animals strolling towards waste ground and feeding by the side of the road. The dead animal was removed from a ditch by the side of the motorway where its body ended up following the drama around 4pm. While the carry truck lay mangled at the site of accident, two bloodied elephants were seen walking across the busy dual carriageway which had to be closed by the police as motorists watched in amazement from a distance. It is stated that one elephant died after collapsing into a ditch on the side of the road after the crash. Fortunately, the others being transported were safe though two of them had bleeding injuries and was treated and taken to another area. They revealed, in a tweet which they probably never thought they would have to write and is unlikely to be repeated: 'The A30 has been closed because a lorry has overturned. Elephants are loose on the tarmac. 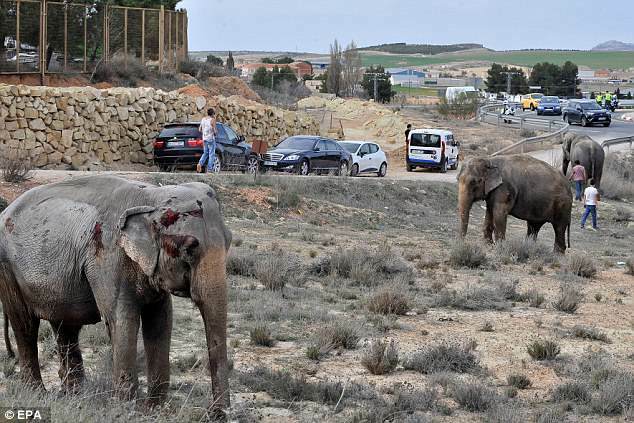 DGT spokesman Gregorio Serrano said: 'The elephants injured in the accident that has happened in Albacete are being assisted and removed. The report added 'Of the five animals one has died and two have been injured. One stunned motorist, who filmed the animals wandering around on the tarmac seconds after the accident, said in a running commentary over his home-made video: 'Accident on the A30 motorway near Albacete. 'A circus lorry has overturned. Four elephants are loose and one looks in a very bad way. I'm not sure if it's dead or not.' The president of Spanish animal welfare political party PACMA, said the animals belonged to the Gottani Circus, which has performed several shows in the area over Easter. She tweeted - 'We treat animals like slaves. Enough of circuses that use animals.' There was no immediate response from the circus owners. The accident is believed to have happened after the HGV they were in overtook another vehicle and the driver lost control as he headed back into the slow lane. Civil Guard officers will now send a report on the accident to a local investigating judge who will be tasked with a routine probe into the incident. 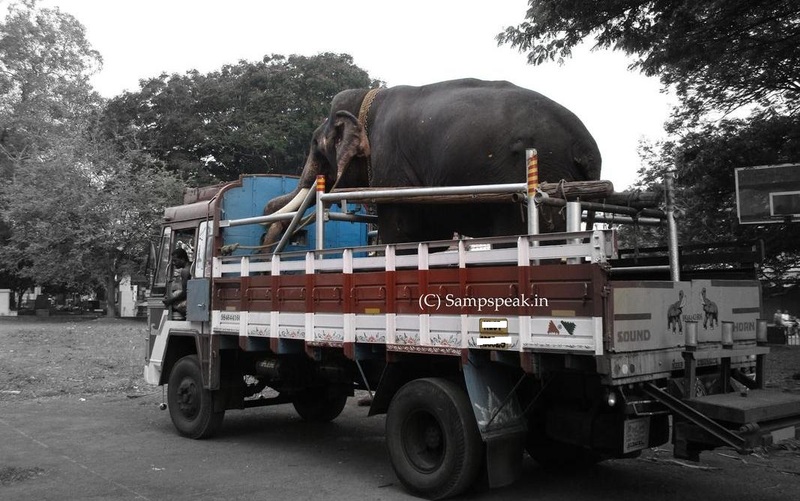 Sad to read of the passing away of affable elephant ~ but if it had happened in this part of the World, Western World sure would have jumped to the conclusion that it was inhumane transit that resulted in death and that it was not a road accident.